The big, blueClamshell is now working as a login computer for my computer labs.It is replacing an old PowerBook 500 series laptop from1994, which will be consigned to the ash heap of history. Wipe thosetears away - the 500 served faithfully, but the hinges on the screenswere wearing out and hard drive bearings started to squeal like pigs.Besides, the Clamshell has a bigger screen - and I can run OS X onit. 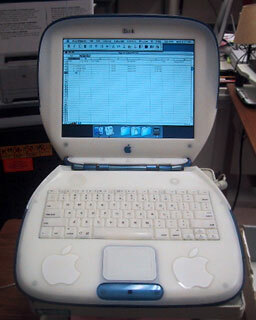 No other laptop looks like a clamshell iBook. My boss' daughter had left some files on the Clamshell when I gotit, so when I installed MacOS X 10.3 "Panther" on it, I used Disc Utility to erase thehard drive. I was able to install using the Clamshell's CD-ROM drive(which proved it worked), but since the Clamshell I got has FireWire, Ican also use FireWire Target Disk Mode to install Mac OS X 10.4 "Tiger" with myPismo. I have put such an installation on hold, since it would require meto buy a 512 MB memory stick and install a larger hard drive. I havetaken apart a Clamshell in the past, but if I replace the measly 10 GBdrive in it, I will not want to have to replace that drive in thefuture. One and done. So without these upgrades, I'm just going to playwith it for now. The one thing that you notice right off with the Clamshell iBook isthat it is sturdy and heavy. This is a computer that can take a lickingand keep on ticking. It is a great laptop for field work and would be agreat first computer for a youngster. It has an AirPort Card, modem,Ethernet port, FireWire 400, USB 1.1 (which means that my iPod touchdoes not want to charge or play nice with it). My Pismo's PC Card slot allows me to run USB 2.0 on it, so the iPodtouch can sync and recharge with iTunes 8. The Pismo is still, IMO, oneof the greatest PowerBooks ever If I were to use an older iPod, theClamshell would probably support it, but I will have to wait until mydaughter updates her iPod nano to check that out. Back to the Clamshell. I set up an account for students to use forthe login function. I choose Simple Finder and limited it to runningAppleWorks. (Funny story, I couldn't find my AppleWorks install disc,but I used a FireWire cable and Target Disc Mode to copy AppleWorksfrom my Pismo. Still, where could I have put that install disc? )Hopefully, this "stripped" account will keep the curious and ingeniousmonkeys that visit my lab from doing anything to the Clamshell. I set up a spreadsheet for them to use, but it is a littledisappointing that a number of students have to have the featuresexplained to them. They Twitter. They use Facebook and YouTube. But aspreadsheet baffles them. I remain a little worried about SocialSecurity. I don't find the relatively small 800 x 600 pixel screen all thatmuch of a handicap, and the keyboard is good, although not at the PismoGold Standard. That keyboard just has the right feel for my ham-handedattempts at typing. Still, the clamshell is okay for typing and surfingthe Internet. Obviously, videos might be a big issue, and I think thatOS X gaming is a stretch. Still, you could partition the drive andrun OS 9 on it for some "Classic" games. The AirPort Card means you can hang out at Panera and show off your"cute" computer to other wireless users. It would make a good travelcomputer, in that it has little value (one would hope) in the stolenlaptop market and, of course, you would not be out much if it wasstolen or lost. I wouldn't particularly use this as everyday workhorse,but it might be a hoot to take on vacation. It's probably a great icebreaker at an InternetCafé, but if you get a little too enthusiastic about describingit's history and features, you could put your audience to sleep. But just show them the built-in handle and they'll perk right up. Nomodern notebook has that!